A skin beautifier sold all over Southeast Asia! For pimples, blotches, and sunburn. 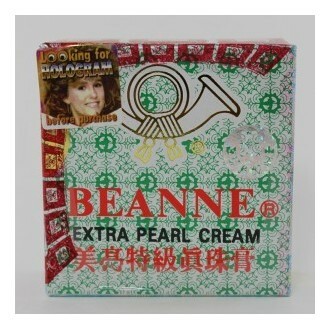 Blended with the finest medicines and pearl powder, through modern scientific process. It has an incredible effectiveness for beautifying your face, especially for removing the freckles, pimples, blotches, sunburn and wrinkles. Warnings If your skin has strong reaction after applying this cream, if it feels a bit sore or become coarse, it is the result of absorbing dirt from the skin. Do not worry. Use the cream continuously by addiing the quantity gradually. If your skin is sensitive after applying this cream, if it feels a little swollen, wash your face with 3% solution of boric acid soaked with a cold wet towel. If you are out in the sun a lot, apply this cream as a night conditioner. Simultaneously, eating fruit and vegetable, getting enough sleep, and keeping good digestion, will have a rapid effectiveness for the treatment of freckles, pimples, blotches and prevent from reoccurance.